There's a real puzzle afoot in Secret Mysteries in New York, and it has to do with the game's title itself. 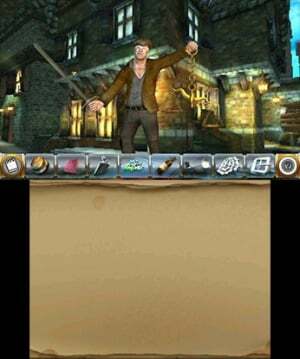 No, it's not our attempt to figure out whether or not the phrase "secret mysteries" qualifies as redundant; it's why the developers bothered to rename Secret Mysteries in London for its eShop release. The original game was a European retail title, and we suppose the publisher wanted to use a more "recognisable" city for the game's release stateside. After all, it's a well documented fact that nobody in North America has ever even heard of London...and even if they had, it's doubtful that they would ever believe it's a real place. The only change between Secret Mysteries in London and Secret Mysteries in New York is the title. 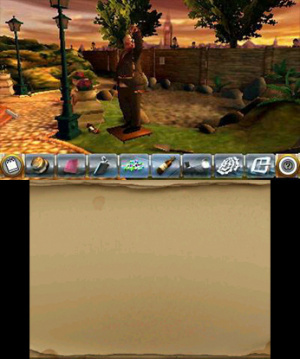 Even the specific references to London are left in the game, with scattered newspapers reporting on the crime-wave you're investigating as taking place in Europe. Unless New York has seceded from the United States and returned to the British fold without telling anybody, we have to assume this oversight is evidence of a pretty sloppy attempt at rebranding. It's unfortunate, too, because Secret Mysteries in New York is one of the better hidden-object titles in the eShop. It's not without its problems, but such carelessness in the localisation reflects more poorly upon the game than it deserves. You mainly control Oscar Gaebelein, an All-American name if we've ever heard one. There's a framing device regarding a modern-day reporter who is reading Gaebelein's diary, but that's just for structural reasons. Each stage is a room that you can navigate to some degree, and your objective is always to find specific items that are hidden throughout the area. The 3D effect on the top screen is nice — and it's put to some lovely use in the opening cinematic — but it doesn't contribute much to the gameplay itself. That's fine, however, because the touch screen does. You use the stylus to tap and swipe as usual, with a responsive cursor gliding about on the top screen. Any initial feelings of disconnect are overcome pretty quickly, because the interface works better than one might expect. All you do is move the cursor and tap when it's over an object you'd like to select. It's simple, but we mean that as a compliment. The problems come with the movement. In each room you can walk forward and backward by using the circle pad, but it's not as straight forward as you might think. Depending upon the orientation of the room, pressing forward could actually make you move sideways, or circle around a desk, or even move backward. It's counter-intuitive more often than not, and wrestling with movement in a hidden object game seems like a pretty needless complication to us. You can also turn your head left and right with the circle pad, but Gaebelein must be recovering from a pretty severe neck injury at the time of this game because he turns with ridiculous stiffness. Only very rarely do you even need to turn your head in order to find something, and when you do you'll be holding left or right and waiting for several seconds before there's any noticeable change in perspective. It's a feature that sounds like an interesting wrinkle to the basic hidden object approach, but in actuality it just creates a problem that it then fails to address. 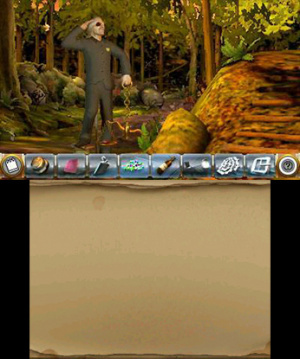 The environments look nice enough, but it isn't long before the game begins to reuse them. You'll return to the same rooms, and even when you're in a new area you'll quickly start to recognise the objects as things you've already found elsewhere. This is a shame, because the central mystery — regarding a serial killer known as The Sculptor — is handled quite well. The story is impressively told, with a shocking amount of darkness and gore uncovered throughout the investigation. It's probably among the best narratives available in the eShop, and it's a surprise to find it attached to something as simple as a hidden object game. However, the genre works against it. Gaebelein's investigation may lead to some interesting twists and turns, but his methods are truly bizarre. Quite how stuffing his pockets full of miscellaneous garbage helps to bring The Sculptor to justice is never explained; the story unfolds between rooms, because nothing the game has you do really relates to what's happening. Every so often you'll find a pamphlet or a photograph that sheds some light on the case, but that still doesn't explain the apple core, ink bottle, paperclip, wad of chewing gum and taxidermied squirrel he felt the need to pick up along with it. There's also a disappointingly handled puzzle element to the game. Every so often you'll be presented with a non-hidden-object challenge, but they really just feel like busy work. Whether it's tapping on buttons until a box pops open or needlessly tracing something you find on a piece of paper, the puzzles are more of an irritating intermission than a step forward for the genre. 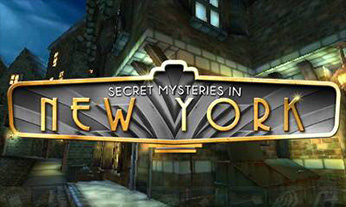 Overall, Secret Mysteries in New York comes across as a bit of a misfire, but it does succeed in stirring up some intriguing atmosphere through its evocative soundtrack and gruesome imagery. It's a noble failure, at least, but it also could have been so much better. 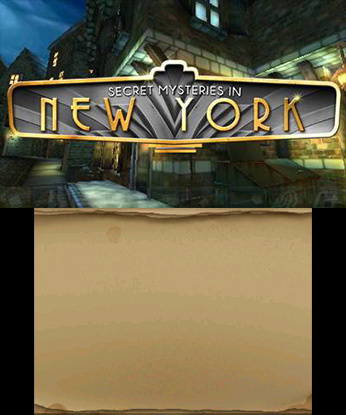 Secret Mysteries in New York is a bit difficult to recommend fully. While it definitely provides a narrative and atmosphere that far outsteps any other hidden object game you're likely to play, the unfortunate game design choices and unintentional comedy of somehow being in both New York and London at the same time does drag things down a bit. If you're absolutely craving some object spotting and can overlook those issues, there's a lot to be happy with here. If you prefer your hidden objects to be a clean and simple affair without any unnecessary — and in some cases annoying — fluff, then this is a case best left closed. Ha, that's great! More games should take this approach to unique branding for different areas. I would love to play Super Mario 3D Cabot Trail on my Wii U. Works for me! I actually was about to buy it but decided to wait for reviews and waste my money on something else. Guess it goes back to my "buy in case of extra money" list. It's called Secret Mysteries in Amsterdam in The Netherlands. I think it was a terrible game. Boring scene's some items are very difficult to spot, the story is not interesting at all and the way the story is told is soo boring. The locations are exchangable as well. I never had the feeling I was in Paris, London, Amsterdam or New York. Such a shame. Now I feel like checking if they changed the name for spanish-talking countries too. (When I last visited the eshop it was set to united states). @SkywardLink98: It's a giant meme. I doubt many people wouldn't get the reference. I've caught the occasional more obscure reference, namely one to a British pop band my grandfather would play records of when I was really young. I would have been happier if this was "Secret Mysteries in the Nintendo World store in New York" Been there many times. Lovely place. Wooow! That is hilarious about the city name change! Great review as always Phil! thats funny stuff...was on the fence with this one...most likely wont get it now. nice review, thanks! Woo, you used my motto in the tagline! I'm glad this just went on sale on the eShop. It gave me a reason to look up this review and read it again. Funny stuff. "After all, it's a well documented fact that nobody in North America has ever even heard of London...and even if they had, it's doubtful that they would ever believe it's a real place." "You mainly control Oscar Gaebelein, an All-American name if we've ever heard one."